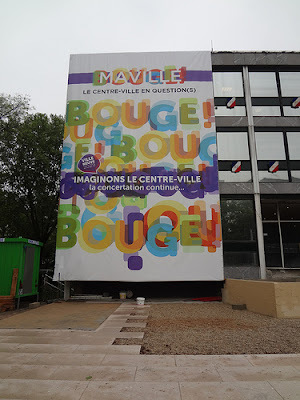 Virtually everywhere you go in the Parisian banlieue, you will find large signs drawing attention to "urban renovation" — major facelifts for large housing projects (cités), new public spaces in the centers of villages and towns, better integration with the myriad transit projects currently underway, entire blocks of housing. Omnipresent construction, like most initiatives in France, is being done by a complex network of public, private and semi-public actors operating at every scale. Ideologues of either state or market would be incapable of understanding new development in France, for everything is a public-private partnership when you drill down deep enough. Regardless of who seems to be in charge of a project, there is liable to be a large billboard outside the construction zone with a celebratory rendering of what this space will look like — be it a revitalized public park, a downtown shopping zone or an eco-housing development built by a major developer. This, of course, is nothing unique — billboard-sized renderings have become part of the international language of city-building. Each of these pictures (top and bottom) are of the same site in Villeneuve-la-Garenne, but only one depicts an actual place. What is notable about these billboards is the people shown occupying the new space. It doesn't take a scholar of race to guess that the answer is not those who look anything like the population of the banlieue. The actual center of Argenteuil (above) and the rendered version (below). The shocking thing about the "whitewashing" of places like Argenteuil, Choisy-le-Roi, Villetaneuse, Drancy and Asnières is how thorough it is, and how little it matters if it is formally a public or private venture. For me, what started as a passing observation has evolved into a research project. Of the hundreds of people in what are now dozens of renderings I've encountered in housing projects across four districts (departments), there are only a few people of color. And not only are the white people everywhere, they are often particularly blond and bourgeois or seemingly part of the vast "bobo" class that has started to gentrify places like Montreuil and Pantin. At times it feels like a bad joke: in a major poster for the T8 tramline — which will connect Épinay-sur-Seine with Saint-Denis — the only black person, among over 50 people, was playing basketball. 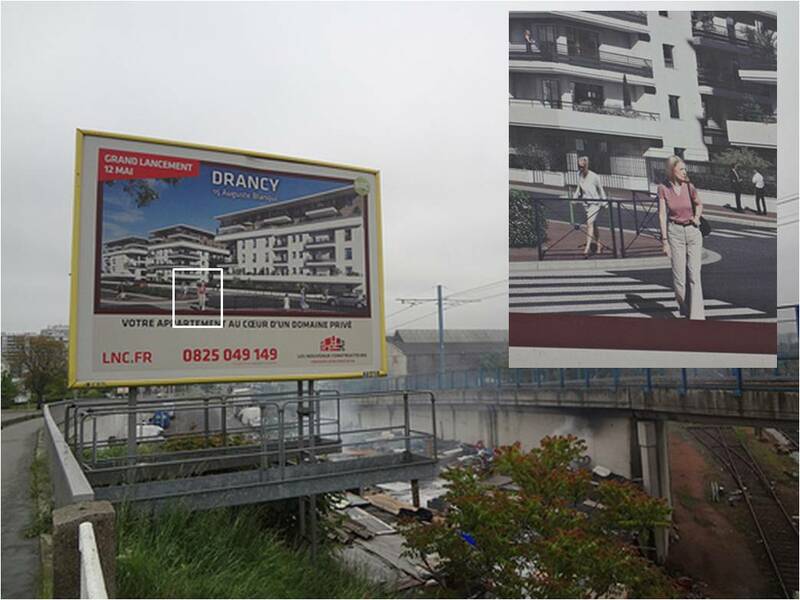 The box in the upper-right corner is a blown-up version of the billboard to the left, near the Drancy-Bobigny border. The smoke in the background is from an informal settlement. Although I can't prove quantitatively that this is a false rendering — France doesn't collect data on race, based on a tenet that since race exists only in theory, in theory it doesn't exist — not only do these cities have significant communities of color, I'd bet my bike and camera that many are now majority minority. 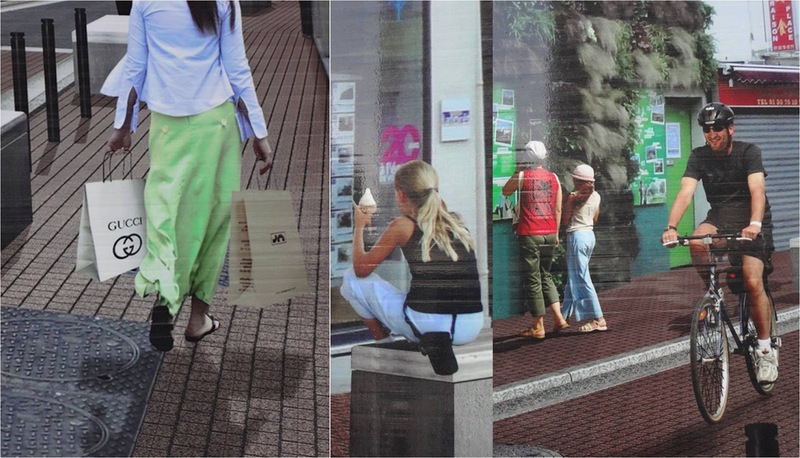 I'd also be willing to wager that in many communities where these renderings have been tacked up in public space, they have been false for a generation now. Moreover, these renderings belie the fact that people in the public spaces of metropolitan Paris are strikingly diverse, both in the banlieue and in the city itself. 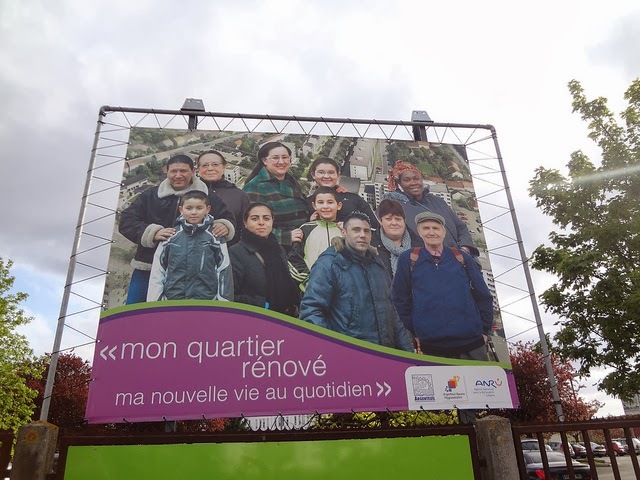 There are a few exceptions to the many disingenuous billboards on display, including the group picture (above) from Argenteuil. 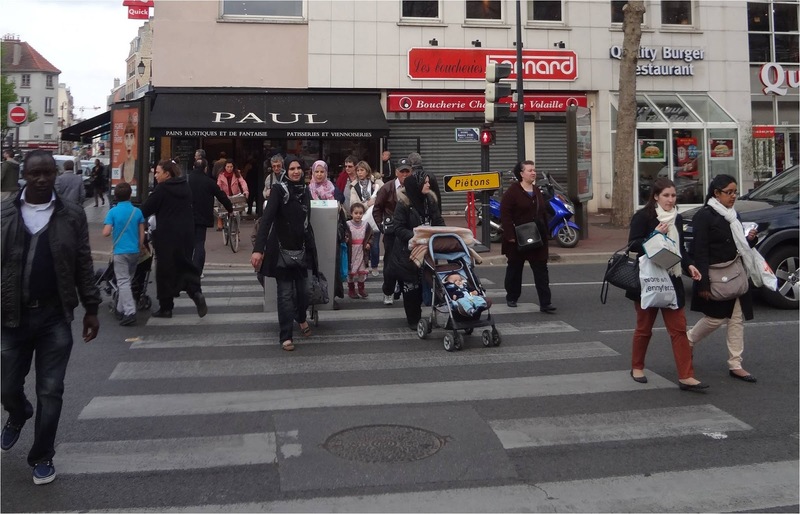 But even this one, clearly intended to promote the harmonious vision of a multicultural and inclusive society, erases one of the most visible aspects of life in metropolitan France: Muslim women with head scarves. 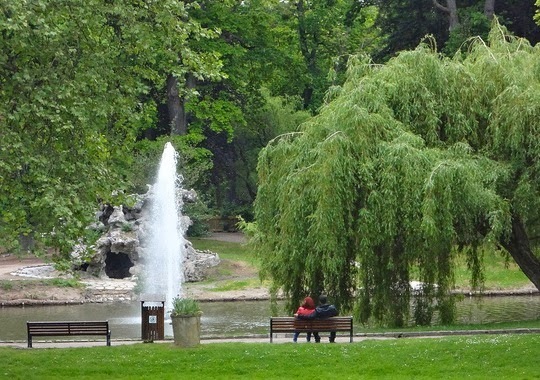 Spend five minutes on a busy street, in a park, on transit or outside a school at dismissal, and you will realize that women with their heads covered are part of the firmament in contemporary Île de France. Head scarves are a lightning rod for controversy in theoretically secular France. The urbane nation where James Baldwin felt so at home will surely be aghast at this whitewashing; but even much of the progressive wing of the French establishment would likely sit on their hands at the failure to show women in head scarves occupying public space, even if they are an undeniable presence. Credits: All pictures by Alex Schafran. This looks like a really surprising case of gentrification, especially the advertising angle, but also the way improvements in transit connectivity play an enabling role. It is also surprising that France doesn't collect statistics on race. In some ways this seems like an enlightened policy but it doesn't seem to have done much to reduce injustice or strengthen relations between people of different cultures. What is to be done? Where will current residents of less expensive districts go? Will Greater Paris become more culturally and economically polarized? fascinating. 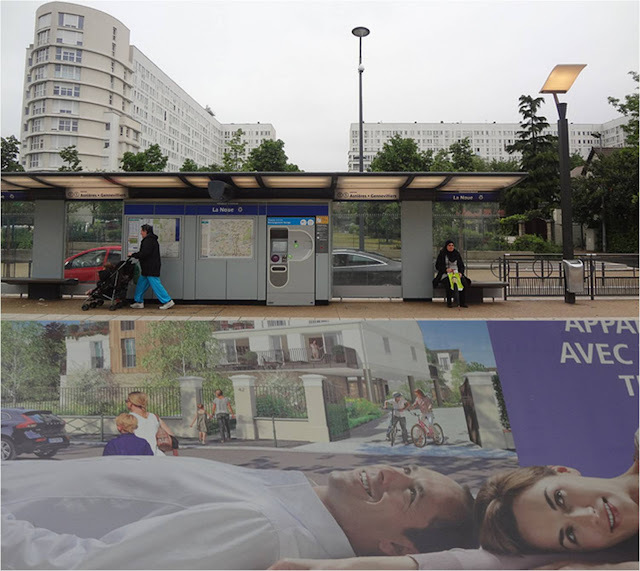 so what do residents of the banlieues say about these projects/these representations of what their neighborhoods will look like? I was amazed at the informal settlement below the billboard. These kinds of rapidly transforming areas once on the margins of major cities could use more research, action research, and activism to assure that benefits of development don't pass over the people who already live there. The headscarves are devisive. The Muslim religion does not require them. Islamists promote them, however. They are a deliberate provocation.